Shoe inserts are non-prescription foot supports that are designed to be used inside a shoe. Shoe inserts are usually helpful for a wide variety of foot ailments such as foot and leg pain as well as flat arches. They are specially designed to not only provide comfort but also cushion your feet as well as support the arches. However, these inserts do not correct bio-mechanical foot issues or even treat long-standing foot problems. Some of the most common shoe inserts types include arch supports, insoles, heel liners and foot cushions. Foot cushions are often used to create a barrier between the shoe and your feet especially when the shoes rub against your toes or heel. Also referred to as heel cups or heel pads, heel liners are used to provide an extra cushioning especially in the heel region. Arch supports are designed with a bumped-up appearance that helps to support the natural arch of the foot. Insoles are often slipped into the shoe to provide extra support and cushioning and are often made of plastic, foam or gel. Today, the market offers a wide variety of shoe inserts to choose from. Since people have varying foot structures and conditions, it is very important that you take your time to choose the best shoe inserts that suit your feet. There are several tips that can be helpful in identifying the best inserts that meet your needs. First, you must consider your health. For instance, those suffering from diabetes or with circulation problems are advised against using over-the-counter shoe inserts as you may end up making your condition worse or even increase the risks of infections and foot ulcers. In this case, you are advised to consult a podiatrist who can guide you in selecting the best solution for your condition. Secondly, you should consider the purpose of your shoe inserts. Different levels of activities require different types of inserts. Those that are designed to provide a little arch support and comfort in work shoes may not be appropriate for running shoes. When looking for the best inserts for your shoes, you should also consider bringing your shoes so as to select the most suitable and effective inserts. Ensure that you go for the inserts that fit your shoes or sneakers contours. When possible, try fitting them in your shoes and try it out by walking around the store for a while. If your store does not allow you to try them out before purchase, ask them about their return policies. The various types of shoe inserts are designed to be used for varying purposes. Comfort insoles are ideal for those who usually experience tired feet and foot pain as a result of prolonged walking or standing on hard surfaces. Their shock-absorbing properties help to provide relief as well as comfort. They can either be shaped or flat and mostly made of foam or gel. Achy or tired feet can also be due to insufficient support in your shoe. If the comfort insoles do not provide quick relief, you might want to try out a firmer support rather than extra cushioning. Support insoles are designed with harder materials to provide stability and structural support. Rather than direct cushioning, they provide support by increasing stability. Support insoles are ideal for various conditions including structural misalignment, heel pain, discomfort in knees, ankles, neck and head, plantar fasciitis as well as supination. They are often available in different profiles and models to match all foot shapes and footwear. Insoles can also be used to change your shoe volume or the internal space of your shoes. High-volume insoles are suitable for high-volume footwear such as running shoes, ski boots and hiking boots, while low-volume insoles best suit low-volume shoes including cycling shoes, skate ski boots and in-line skate boots. Besides the insoles, the thickness of the socks can also determine how well your shoes fit. Insoles are also effective solutions to numerous footwear fit issues including heel slippage, foot elongation and collapsed or low arches. In addition to the regular over-the-counter shoe inserts, there are other prescription insoles and specially designed devices commonly known as orthotics. These devices are designed to provide ultimate comfort and support to your feet and are normally crafted and customized for your individual feet. Their designs ensured that they precisely match your feet contours as well as how you move, walk or run. Orthotics are usually manufactured once your podiatrist has carried out a complete evaluation of your legs, ankles and feet. This ensures that your orthotic accommodates your foot’s unique pathology and structure. There are two main categories of prescription orthotics. Functional orthotics are often made from graphite, plastic and other semi-rigid materials and are specially designed to help treat foot pains as well as control abnormal motion. They are also effective in the treatment of injuries including tendonitis and shin splints. Accommodative orthotics are made from softer materials and are meant to provide extra support and cushioning. They are often used in the treatment of various uncomfortable feet conditions including painful calluses and diabetic foot ulcers. Once you have purchased the best shoe inserts for your feet, there are several insole care tips that you must know to ensure that they provide maximum benefits for long without damaging or wearing out. When used on a regular or daily basis, most over the counter insoles last for about a year. Seasonally and occasionally used shoes can extend the time to use the insoles to several years. Some of the top shoe inserts care tips include airing them out, washing them as well as regularly inspecting them. People with wet or sweaty feet should air their insoles regularly to allow the moisture and sweat trapped between the shoe and the insole to dry out. Inspecting them helps in identifying any signs of wear or deterioration and when they need to be replaced. When you are simply looking for the best shoe inserts to provide additional support and cushioning, you may go for the regular shoe inserts available in most stores. However, when you are suffering from complex health conditions, you should seek the help of a podiatrist who assesses and examines your condition using advanced technology, before advising and recommending the best inserts for your condition. In addition, they might suggest other forms of treatments to enhance the function and comfort of your feet. Since reviewing the insoles below, I have found my new favorite pair of insoles. They are from Tread Labs! For reasons you will soon learn about, I have dedicated an entire page to reviewing them. Clicking the above link will take you to my review of the Tread Labs Stride insoles! For people who have experienced bad arch pain, these are some of the best liquid shoe inserts that you can get. These HydroFeet insoles are filled with FDA approved glycerin. This will make your foot comfortable when you are walking. It almost makes you feel as if you are getting a massage. The harshness that is caused by, say, walking on a concrete floor, will hardly be felt while wearing these. Any pain you might experience when walking on these insoles is sure to be drastically reduced. These orthotics accomplish this by equalizing the pressure inside the shoe, making the feet feel like they are floating. It creates that cushioning feeling. They act as shock absorbers. They come with a three years warranty, meaning that when you purchase one, you will not have to worry about buying another one in the near future. These are some of the best shoe inserts for excessive supination, extensor tendonitis, fibromyalgia and other conditions. This is simply due to the fact that they have been designed with alleviating (leg)s pain from foot conditions in mind. They have a water soluble formula, that does not damage your shoe or your clothing even if they break. They are safe for pets and children as well. These Hydrofeets are safe for hand or machine washing, but they must be air dried only. These Hydrofeet insoles are good for a large number of foot conditions such as heel pain, back pain, poor circulation, corns, and peripheral neuropathy, among others. It helps to increase the circulation of blood to the foot, giving you a soothing sensation. It doesn’t matter whether you’ve got a hammer toe, fallen arches, foot drop, gout, or whatever else ails you… With Hydrofeets, you are going to increase your comfort. These are definitely quality shoe inserts, suitable for running and standing up all day. This is the ideal insole for people who are standing most of the day. Normally, when you stand for long hours at work or at home, your feet will become painful, which can make walking very uncomfortable. These insoles can significantly reduce the pain that you will experience on long days of standing up. With these shoe inserts, you have a guarantee that hard surfaces will not cause any discomfort while walking. You can also trim the insoles, so that they can fit any shoe that you want them to be in. They come with an outline to help you when you are cutting them into the size that the fits your shoe. Also, it’s vital to be careful when cutting to avoid damaging them more than necessary. You can’t repair an insole from which you’ve cut too much. These are some of the best shoe inserts for standing on concrete all day, but also for just taking long walks or hikes. You can use these insole for a period of more than 3 years without having to replace them. They have a heel gel that is very effective in making your feet feel like they are receiving a massage when you are walking. This gel acts as a shock absorber, reducing the impact between the feet and the hard surface. These are great shoe inserts for a better fit. They give you more knee support than many other, ordinary, insoles. For people whose job involves walking a lot or standing all day, these shoe inserts are totally worth having a look at. They have a honeycomb design that allows the gel to act as a spring under your feet. This in turn becomes a shock absorber, thereby reducing the stress to the feet caused by hard surfaces. It has a medical grade gel integrated in them. These are very suitable for relieving pain of existing foot conditions. They are comfortable to wear, as they will give you the experience of a massage when you walk. During physical activities, these shoe inserts are vital for improving your performance. They will protect your feet from any pain that may occur as a result of your physical exercise. They give you excellent support for people who are flat footed. But they can be used by people with all types of feet. They are easy to trim so that they can fit your shoes. It’s important to trim them to fit, because only then will they give you the best experience. Using sharp scissors or a box cutter will give the best results when trimming. These insoles are great, because they give you the same comfort at a lower price in comparison to other expensive brands on the market. They are slim and easy to insert into your shoe without too many problems. This is an athlete tested insole, which will make your feet feel comfortable even when you subject them to rigorous physical exercise. They cushion the feet where needed the most, especially for people who have to stand all day at work. They have a massaging gel that gives you some shock absorbing to your forefoot and heel. They are good for people who are in search of some extra padding in the ball area of the foot. These orthotics will help relieve foot pain that is sometimes the result of walking long distances. They can be machine washed or hand washed without problems. But keep in mind that it’s important to make sure that they are dry before inserting them into your shoes. They come with an outline for different shoe sizes, making it easy to trim them to match your shoe size. This can be done using a pair of scissors. When trimming, you might want to try making them half a size larger than your shoe’s size. This way, they can cup your heel as well as your toe. The reason for this design is that it gives you the best protection for your whole foot. This makes them great shoe inserts for shoes that are too big in the heel as well. If you have flat feet, foot pain, or are overweight, you should definitely consider these insoles. At this price, it’s hard to go wrong with them, as they are pretty much guaranteed to increase your foot comfort. These shoe inserts are made of high quality gel materials. They have gel at the forefoot and at the heel. The gel acts as a shock absorber with every step you take. The insole supports your arches and improves your balance when you are walking, making them one of the best arch support shoe inserts currently on the market. They come with different foot outlines. This makes it easier to cut them in order to make them fit your shoes. It is important to wear insoles that are well trimmed, in order to get all the comfort out of them that you can. These insoles can be used as a pain reliever for people with low arches, corns, bunions, and other conditions. The crystal clear silicone gel arch support will swiftly take care of discomfort you might currently feel with every step. They can be used for walking, sporting and hiking by both men and women. They have an anti-bacterial effect as well. So not only do they give you a comfortable walk, they will also help you reduce nasty foot odors. These inserts also maintain their shape for a long time. This guarantees that you’ll be able to enjoy them for a long time, before having to replace them. This makes them some of the best orthotic shoe inserts for flat feet, pronation and arch support. These KevenAnnas are carbon fiber shoe inserts. The carbon fiver removes any existing odors that may exist in your shoe. The stomatal (porous) design ensures your feet will remain fresh for a long time. They can be easily washed. They also have sweat absorption capabilities. This in combination with the anti-bacterial effect, is going to make sure that your feet will remain dry and comfortable. Even when wearing your shoes for long hours. Powerstep’s originals are made with a design that makes them one of the best orthotic insoles on the market. They have an encapsulated design that is a firm but flexible support shell. Its stability is increased by the presence of an inbuilt arch support and a heel cradle. There is a moderate dual layer cushioning, which gives you some of the best comfort to your feet. Made with ultra-thin design, they fit easily in casual and athletic shoes. These ultra thin shoe inserts have negligible weight and won’t make your shoe feel heavy at all. They are best for preventing or curing foot pain caused by metatarsal pain, arch pain, plantar fasciitis, and so on. They give you an effective and economical alternative to ordinary orthotics. These metatarsal shoe inserts give you great comfort after breaking them in, which usually doesn’t take more than a week. They are designed to last a long time, giving you the most value for your money. That is why they are a really great buy for relieving painful foot complications, that may currently be causing you discomfort. Podiatrists recommend this orthotic insole highly. They are hard at first, but soften a little with prolonged use. They will shape to your feet a bit without compromising too much of their supportive form. They might feel a little uncomfortable at first, because your tendons, muscles, and ligaments are not used to them. But you will break them in fairly quickly with frequent use. These insoles are great for people who have to stand up at work all day. These insoles are made of a premium material, that make them last longer than most others on the market. They are made of a combination velour and polyurethane fabric. The polyurethane gel acts as an excellent shock absorber, which gives you some of the best pain relief money can buy. The velour fabric helps in keeping the foot fresh by absorbing all the sweat and other moisture that might make its way into your shoe. The combination of these fabrics, makes these shoe inserts one of the best buys for comfort and pain relief. 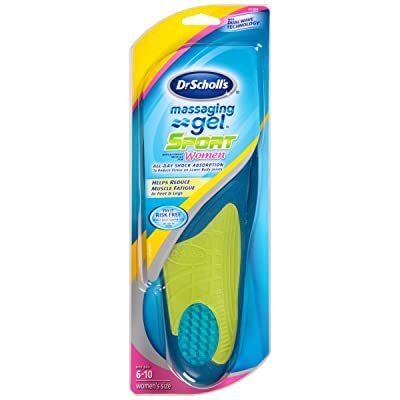 They have a massaging gel that provides you with a soothing and relaxing feeling with every step. These shoe inserts will make your walk more comfortable, by ensuring that you will not suffer from smelly or sweaty feet. They absorb pretty much all the moisture that forms in your shoes. They have purposely been made slightly oversized, so that you can trim them to fit your shoes. There are outlines on these inserts, that will assist you in trimming them to the right size. Due to the fact that they’ve been specifically designed with plantar fasciitis sufferers in mind, they will actually help you prevent developing this condition in the first place. These are one of the best shoe inserts for running, walking or standing all day at work. Ideal for people who are always on the move. Pixnor insoles stand out in this list, because they are shoe inserts for height increasing. That’s right, they will make you taller. They are made of a soft polyurethane material, making them score high in the durability department as well. They are comfortable to wear because they have an air cushioning feature. They are effective in foot sore prevention. They also have anti-slip technology. Don’t you hate it when insoles move around in your shoe? You might as well not be using shoe inserts at all, if they can’t even lie still. Sinds these are made of an anti slip material, you can rest assured that you will be standing firmly and stably. They are oversized, so that they can be trimmed to fit in all shoes. They come with an outline that acts as a guideline when trimming them to size. They also give you some added height. The extra height is noticeable, since we are talking about more than 2 inches here. These shoe inserts for height increase will give you as much as 2.8 inches extra. But beware… if you use these in low cut tennis shoes, you aren’t going to feel firmly planted anymore. For getting the most out of these, you’ll have to use them in high cut boots. All in all, these Pixnor shoe inserts aren’t just recommended for people that not only want to have great support, but who are also looking for some extra height. This also makes them great shoe inserts for different leg lengths. They are effective for relieving pain and protecting your feet from injuries. If your day involves walking, running, weight lifting, or simply standing up for long hours… these are the best shoe inserts for you. There particular insoles have a podiatric design. They are contoured to increase the comfort of your feet in the shoe. These inserts will eliminate a big portion of any discomfort, pain and/or aches that your foot may currently be suffering from. These are meant to be worn the whole day without causing any discomfort. They are made of a breathable material. They also have an antimicrobial fiber, that makes them comfortable to wear for extended periods of time. Their design enables them to relieve pain from existing conditions such as shin splints, knee pain, heel spurs, aching legs, plantar fasciitis, runners knee, diabetic neuropathy, intoeing, it band syndrome, and so on. They are designed to be worn in both men’s as well as women’s shoes. Like most insoles, they can be trimmed easily so that they will fit your shoes. They come with outlines, which makes the trimming process as easy as it gets. You wouldn’t want to damage your new shoe inserts beyond repair. They act as shock absorbers, greatly reducing your chances of sustaining foot injuries. They also give you excellent arch support, so you can rest assured that you are going to be standing firmly. They can be either machine or hand washed, but make sure that you air dry them only. They will keep your feet fresh throughout the whole day. They will absorb sweat and moisture as an added bonus. This prevents nasty foot odors that would otherwise arise from your footwear. No more stinky shoes with these top rated shoe inserts!